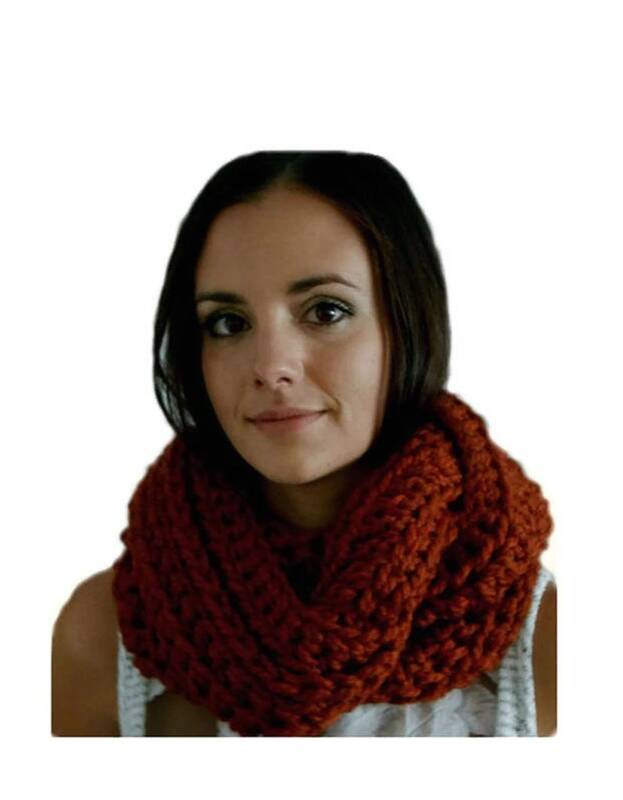 This handmade extra long infinity scarf cowl in a dark burnt orange, rust pumpkin spice color is crocheted in 2 Sisters Handmade Exclusive Design using 5 Star Rated soft, wool blend, thick bulky yarn. Super long and super versatile! The infiniti scarf cowl is about 70 - 72 inches circumference and about 6 inches wide in wool blend yarn in a lovely "Spice" color ... dark burnt orange, pumpkin. It can be worn as a trendy long single loop, double it for a chunky infinity scarf or triple loop it for a super chunky infinity cowl scarf. This chunky infinity scarf will look fab with your sweaters, jackets & coats this season! It is crocheted in a distinct and interesting stitch pattern on one side and ridges and valleys on the other. There is a slight 1 inch variation (seam) where each row is joined. CARE: Machine Wash Gentle & Dry Low-- However we suggest you Lay it flat to dry. Copyright 2012 - 2018, All Rights Reserved.